Marco Reus shone as Borussia Dortmund opened a nine-point lead over Bayern Munich at the top of the Bundesliga table with a 5-1 rout of strugglers Hanover on Saturday. With defending champions Bayern hosting Stuttgart on Sunday, Dortmund grabbed the chance to thump second-from-bottom Hanover with Reus causing havoc on his return from an ankle injury. "We took our time to find the gaps, but after we changed ends and went 2-0 up it was much easier," said Dortmund coach Lucien Favre after his side floored Hanover with three goals in seven minutes. Achraf Hakimi, on loan from Real Madrid, Reus, Mario Goetze and Raphael Guerreiro scored Dortmund's goals to keep them on course for their first Bundesliga title since 2012. The rout piles pressure on Hanover coach Andre Breitenreiter, but his side showed spirit when Marvin Bakalorz scored a late consolation against his former club before Witsel grabbed Dortmund's fifth goal on 90 minutes. "It's up to others in the club to decide now where we go from here," said Breitenreiter, who helped Hanover win promotion back to the Bundesliga last season. "This isn't about me -- it's about staying up." Hanover started brightly at Dortmund's Signal Iduna Park when forward Henrick Weydandt forcing an early save, but it was one-way traffic thereafter as Reus hit the post on 23 minutes. Soon after, Dortmund left-back Hakimi swapped passes with Guerreiro on the edge of the area and curled his shot inside the post for the opening goal. Reus had an injury scare just before the break, clashing heads with Danish midfielder Thomas Delaney as both charged into a challenge. However, the pair shook off the collision and Reus was instrumental in a flurry of goals just after the hour mark. It started with text book counter-pressing when Hakimi robbed Hanover defender Miiko Albornoz on the edge of the box and squared to Reus who fired home his 12th league goal in 18 games. 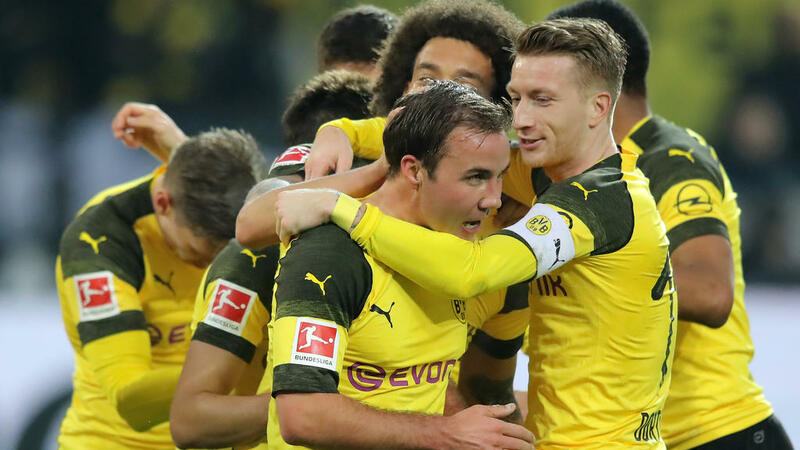 Mario Goetze claimed his second goal of the season when a sublime pass from Jadon Sancho found the Dortmund striker was unmarked to fire home. Reus set up Dortmund's fourth, cutting through the Hanover defence and passed to Guerreiro who netted with the defence cut to ribbons. The game had already turned into a rout even before a glove from Hanover goalkeeper Michael Esser denied Reus, then Sancho in quick succession. Bakalorz scored Hanover's consolation before Witsel found a gap in the defence and his shot went in off the post for his second goal in a week after netting the winner at Leipzig last weekend. Borussia Moenchengladbach joined Bayern on 39 points, but went second on goal difference with a 2-0 win at home to Augsburg. Gladbach midfielder Jonas Hofmann, linked with a move to Tottenham Hotspur, had a penalty saved just before the break before Oscar Wendt and Patrick Herrmann scored second-half goals. Bayer Leverkusen claimed their first win under new coach Peter Bosz when Germany internationals Kai Havertz, Kevin Volland and Julian Brandt netted their goals in a 3-0 victory at Wolfsburg. Hoffenheim moved into the top six with a 4-2 win at Freiburg as Andrej Kramaric scored twice while mid-table Mainz won 2-1 at home to bottom side Nuremberg with Sweden striker Robin Quaison scoring the winner. On Saturday night, Eintracht Frankfurt climbed into the top four with a 2-2 draw at Werder Bremen as striker Sebastian Haller equalised with a second-half penalty for the visitors. RB Leipzig can regain fourth place by avoiding defeat at Fortuna Duesseldorf on Sunday evening.